Whether you need support now or later, we’re here for you. Our Concierge Plans are custom-designed to relieve you of all of your home technology maintenance and protection needs. From your computers and mobile devices to home theater and smart appliances – our aim is to deliver you peace of mind at a competitive price. Joining is simple. You pick the plan that best suits you and your family, and we’ll do the rest. BASIC: $29.95 per month. Perfect for anyone who anticipates a need for the occasional support calls, and training on how to use their computers, smartphones and tablets more effectively. STANDARD: $49.95 per month. Our most popular plan is designed for those with too much technology on their hands to manage effectively. You anticipate the need for maintenance support throughout the year and are interested in more advanced training. PREMIUM: $69.95 per month. Great for the homeowner interested in advanced home entertainment or smart automation systems. This plan is also perfect for the home-based business owner in need of extra protection for their equipment but can’t afford to employ an independent IT contractor. Ready to get started? For more information on how to spend your prepaid service hours, visit our Services page. We’ve got all of your home tech needs covered: Computers | Mobile | Home Theater & Gaming | Data Protection & Security | Wireless Networks | Smart Gadgets Additional information: There is a $20 copay for each on-site visit. Hours include both remote and on-site requests. For each additional service hour not covered by the plan, our regular 30 minute minimum for additional support applies. 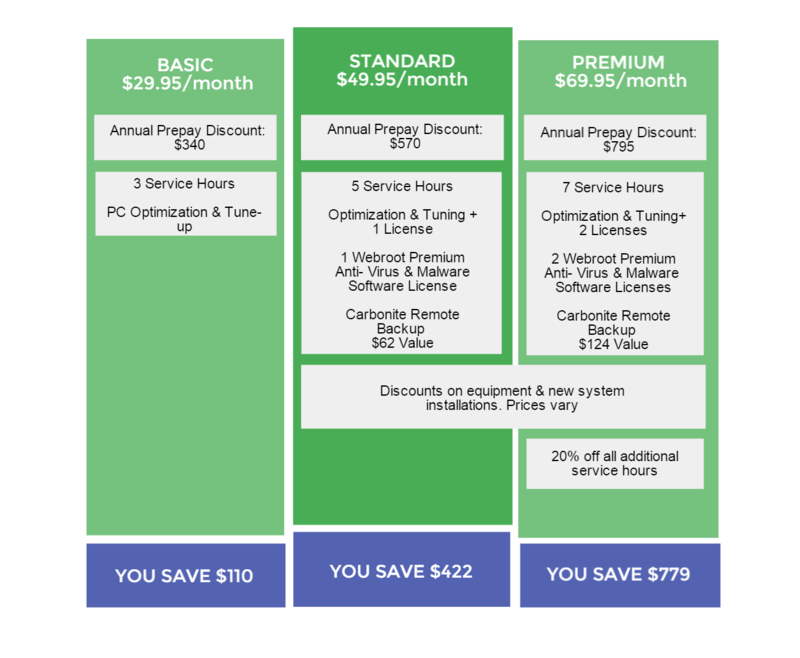 For the Standard and Premium plans – that hourly minimum drops to a 15 minutes. Questions? Schedule an appointment with one of our specialists today!